The Pulse tab provides a quick summary of what your workers are doing at your organization. This page is comprised of four main parts: Staff Assignments, Running Timers, Logged Hours, and Recently Completed. *Note: The Pulse tab requires a special security permission for access. Make sure the Pulse Tab Permission is checked in User Role Settings. Click on the Home tab and then on the Pulse tab. Click the Staff Assignments panel to expand a list of all of your staff work assignments for the current department. 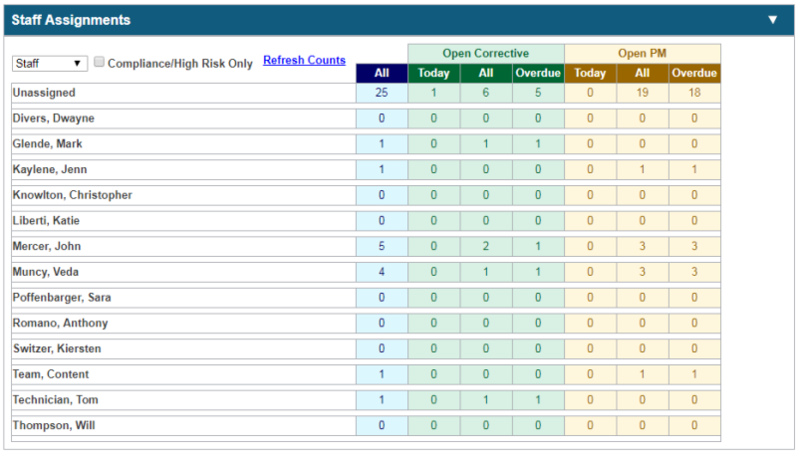 For each staff member, TheWorxHub displays a breakdown of all open corrective and PM work orders. You can see what work is due today and how many work orders are overdue to help you zero-in on the most urgent items. Click on any number to display the list of those work orders for that staff member. From here you can print, mark complete, or reassign. *Note: After using the quick complete dialog, click the Refresh Counts link to display updated counts for all staff. Your staff can run timers when they are at a job site. Any timers that are started out in the field will show under this section of the Pulse tab. This is helpful to identify what work orders are in-progress right now and where in your organization each staff member is located. When an urgent work order arises, simply use the running timers section to find out which staff member is nearby to handle the situation most quickly. If a staff member ever forgets that a timer is running, you can discard that timer from this section by hovering your mouse over the name of the assignee on any timer and click the discard timer link. *Note: This feature requires the purchase of TheWorxHub Mobile. If you are interested in this feature, please contact your sales representative. Tracking time is important on work orders. It provides valuable insight into required effort and productivity, but also adds a level of accountability. If time tracking is important to your organization, the Logged Hours section shows you exactly how much time has been logged for each staff member today. This section shows all logged time regardless of how it was recorded. The Recently Completed section shows the last five completed work orders. Click Load 5 More to display the next 5 work orders. You can click on any of these work orders to pop-up the work order form to get more details and add additional information.